Liquid facelift is probably the most common procedure done in today’s cosmetic surgery practice, following shortly after a simple Botox treatment. It’s a simple in office procedure performed by Dr. Avaliani. She uses a combination of different fillers to rejuvenate and restore facial volume and then uses Botox or Dysport to soften and eliminate wrinkles on the face. Anyone who desires to enhance and improve their natural appearance is a candidate. Dr.Avaliani is an expert in achieving the most elegant and natural looking results. It usually takes between 30 minutes to 1 hour to complete. Which areas/concerns can liquid facelift treat? How long do results last after the liquid facelift? Do I need a maintenance regimen for liquid facelift? Yes, this is your investment in yourself and you need to upkeep it. A typical regimen would include a small maintenance dose of a filler every 9-12 months and/or Botox or Dysport treatment every 3-6 months. How much does liquid facelift cost? The cost of this procedure is highly variable and really depends on the amount of product needed to use and the areas of treatment. It can cost anywhere from $1000- $6000. You don’t have to do it all in one session, and in general it is best to split the treatment session in to a couple of visits to allow the product to settle in. Is there any downtime after this procedure? There is absolutely no downtime and one can return to their regular duties immediately after the treatment. Who cannot get this procedure? Pregnant women and people who have allergies to Lidocaine are advised against this treatment. Are there any side effects of the liquid facelift procedure? Redness, bruising, tenderness and swelling are the most common side effects and can last anywhere between 2 to 24 hours. How do I know if this treatment is right for me? Please call the office to schedule your consultation with Dr.Avaliani and to discuss all our concerns and available treatments. *Results and duration of effect may vary, no guarantee of specific results can be given. Dr. Anna Avaliani is a leading female expert in the latest laser cosmetic surgeries and treatments for the whole body. She has perfected the art of non-invasive techniques to achieve the most elegant and natural results revealing the best you! Her training, expertise and a unique ability to connect with her patients make her a perfect cosmetic physician. She is able to understand and connect with both Men and Women and offer expert consultation that is very unique and very individualized to address any and all concerns of her clients. 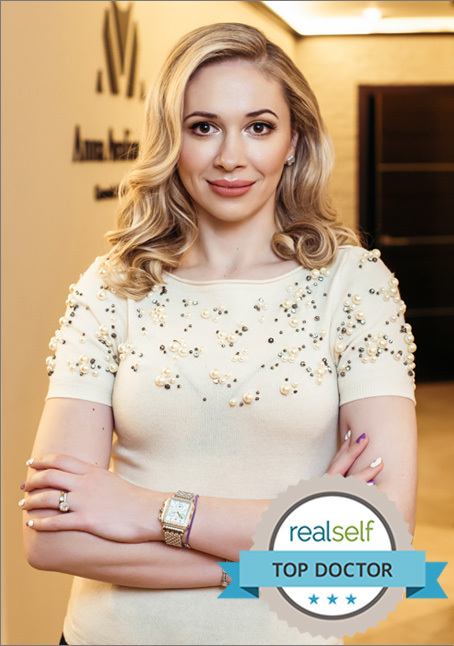 Dr. Avaliani is a founder of Reveal The Best You Cosmetic & Laser Surgery Center in New York City. Our clients are our family and our goal is to build long lasting relationships and "grow mature" together.